​EA Sports and FIFA 19 just released an update Friday called Winter Refresh and have adjusted ratings of numerous players from different leagues. 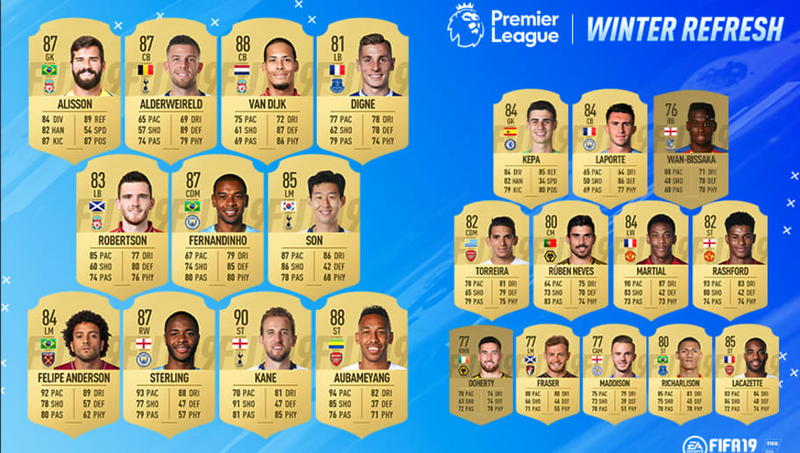 The new Premier League update might be the one that stands out the most, though, as 23 players received an updated rating that honors how well they've played so far this Premier League season. One standout on this list is Virgil van Dijk, who has been a godsend for Liverpool FC. The Reds paid a record fee for van Dijk's services during the 2018 winter transfer window and hasn't looked back. He's given LFC the stability along the backline the team has longed for and has contributed to each clean sheet the club has gotten so far. Van Dijk's rating has gone up three overall points, making him the best centerback in the Premier League, and one of the best in the game. Van Dijk's teammate and goalkeeper Alisson also received an overall boost, as he's gone from an 85 to an 87. The main reason for that is because of the incredible 14 clean sheets he already has during this Premier League season. Another noticeable upgrade was given to Manchester City winger Raheem Sterling. His pace didn't go up any further, but he received a plus-3 boost in passing and then a plus-4 boost in shooting, making him an even bigger threat on the outside. Also included in the new update are the new 'Prime ICON Moment' cards which can be seen ​here.